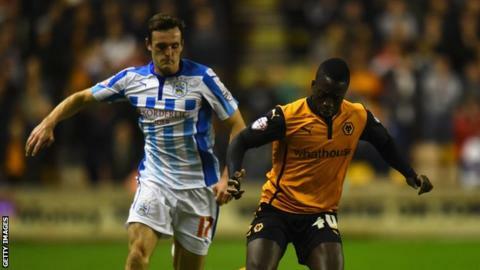 Striker Nouha Dicko scored twice to give Wolves' promotion push a timely fillip with victory at Huddersfield. Dicko fired under Alex Smithies after a through ball from Rajiv van La Parra and it was 2-0 when Conor Coady headed Bakary Sako's corner into his own net after the break. Benik Afobe's strike made it 3-0 before James Vaughan got a goal back for the hosts from Sean Scannell's cross. Dicko made it 4-1 when he rounded Smithies to slot home in injury time. It was a frustrating night for Chris Powell's Huddersfield side after they created the better chances, with Coady's own goal early in the second half proving a pivotal moment in the match. The victory ended a run of three matches without a win for Kenny Jackett's Wolves team and moved them to within four points of sixth-placed Brentford. Huddersfield, 15th in the table, have won four and lost four of their last eight matches. "It's a hard one to swallow. I'm led to believe we created over 30 chances but we gifted two of the goals - the first one is a mistake and he finished it in a flash, and the second one an own-goal, which took the wind out of our sails. "They're a good side - they have some good players who have played at a higher level - but we more than matched them. "It's a funny one. They could have actually scored one or two more on the counter-attack." "I thought the difference tonight was our finishing, which was excellent. There was some real clinical finishing and it's such an important thing at any level of football. "Getting the first goal was a big thing. It was a real quality goal - the ball and the finish from Dicko, who came out of nowhere and did well to tuck it in. "As the away side we were under a lot of pressure but we could still maintain a threat on the break, and with the right combination of passes into the right spaces we could have got more (goals)." Match ends, Huddersfield Town 1, Wolverhampton Wanderers 4. Second Half ends, Huddersfield Town 1, Wolverhampton Wanderers 4. Attempt saved. Sean Scannell (Huddersfield Town) right footed shot from the left side of the box is saved in the bottom left corner. Assisted by Ishmael Miller. Benik Afobe (Wolverhampton Wanderers) is shown the yellow card. Benik Afobe (Wolverhampton Wanderers) has gone down, but that's a dive. Goal! Huddersfield Town 1, Wolverhampton Wanderers 4. Nouha Dicko (Wolverhampton Wanderers) left footed shot from the centre of the box to the centre of the goal. Assisted by Benik Afobe with a through ball. Substitution, Huddersfield Town. David Edgar replaces Murray Wallace. Attempt saved. James Vaughan (Huddersfield Town) header from the centre of the box is saved in the bottom right corner. Assisted by Tommy Smith. Attempt saved. James Vaughan (Huddersfield Town) header from the centre of the box is saved in the top centre of the goal. Kortney Hause (Wolverhampton Wanderers) wins a free kick in the defensive half. Substitution, Wolverhampton Wanderers. Dave Edwards replaces Rajiv van La Parra. Attempt blocked. Jacob Butterfield (Huddersfield Town) left footed shot from outside the box is blocked. Attempt blocked. Sean Scannell (Huddersfield Town) right footed shot from outside the box is blocked. Assisted by Conor Coady. Attempt missed. James Vaughan (Huddersfield Town) left footed shot from outside the box misses to the right. Substitution, Wolverhampton Wanderers. Scott Golbourne replaces Bakary Sako. Attempt blocked. Rajiv van La Parra (Wolverhampton Wanderers) right footed shot from outside the box is blocked. Assisted by Benik Afobe. Attempt missed. Jacob Butterfield (Huddersfield Town) left footed shot from outside the box is high and wide to the left. Substitution, Huddersfield Town. Joe Lolley replaces Harry Bunn. Attempt saved. Jacob Butterfield (Huddersfield Town) right footed shot from outside the box is saved in the bottom left corner. Assisted by Tommy Smith. Attempt missed. Bakary Sako (Wolverhampton Wanderers) left footed shot from the left side of the box is too high. Assisted by Kevin McDonald. Goal! Huddersfield Town 1, Wolverhampton Wanderers 3. James Vaughan (Huddersfield Town) right footed shot from the centre of the box to the bottom right corner. Assisted by Sean Scannell with a cross. Goal! Huddersfield Town 0, Wolverhampton Wanderers 3. Benik Afobe (Wolverhampton Wanderers) left footed shot from the centre of the box to the bottom left corner. Assisted by Rajiv van La Parra. Attempt saved. Rajiv van La Parra (Wolverhampton Wanderers) right footed shot from the centre of the box is saved in the centre of the goal. Assisted by Nouha Dicko. Corner, Huddersfield Town. Conceded by Tomasz Kuszczak. Attempt saved. James Vaughan (Huddersfield Town) right footed shot from outside the box is saved in the bottom right corner. Assisted by Jacob Butterfield. Attempt saved. Conor Coady (Huddersfield Town) right footed shot from outside the box is saved in the top centre of the goal. Attempt missed. Harry Bunn (Huddersfield Town) right footed shot from the left side of the box misses to the right. Assisted by Sean Scannell with a cross. Corner, Huddersfield Town. Conceded by Richard Stearman. Attempt blocked. Ishmael Miller (Huddersfield Town) left footed shot from the centre of the box is blocked. Assisted by Jacob Butterfield. Corner, Huddersfield Town. Conceded by Danny Batth. Attempt blocked. Harry Bunn (Huddersfield Town) left footed shot from the centre of the box is blocked.